HUMILIATION AT WORK : Your views and advice are very much needed my friends! Greetings world of beautiful Steemians! Finally after some long days of absences, I am back writing couple of lines to all my lovely followers and friends around the world of steemit. I've missed you all, but for sure you gonna read from me more often now on! Things have not been so easy for me recently with couple of unfortunate events happening at work - I'll write on my personal experiences in the days to come and share with you all! You must have surely noticed the title of my blog today : HUMILIATION AT WORK!!! I really want to get the opinion of the people here on Steemit about this problem which is so present at so many workplaces around the world. From the information I've gathered and we all know, many people are suffering from bullying, humiliation and harassment at work, but they can't do anything about their rights. 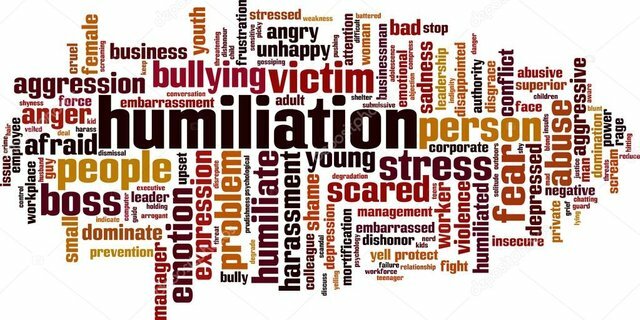 One of the events I've experienced recently is : Humiliation at work infront of all managers of that particular workplace by a senior management member. How does the world of steemit sees this problem? What would you do if you were humiliated at your workplace when you did not do anything wrong? How can the world of steemit help/advice someone suffering from humiliation at work? Can anyone throw sheets of paper on someone's face in a full meeting room? Thank to help me on this guys, I have been a victim and I am in the process to seek legal help on same. I would like to know if I can also get some international support to get justice from the ones who humiliated me. I AM USING SOME BOTS TO HELP REACH THE MAXIMUM OF READERS. Looking forward to read from you! Brother, how are you? I regret so much that you come back this way, but I'm sure everything will be solved and you will come out well of all this, I give you my support steemit is a great window for you to feel at ease, I know that you have people here who support you and wish you the best. People who act bad sooner or later have their punishment, so you will get well out of all this. Hello brother! I really hope justice will be made soon. Maybe they are not lucky enough to have the person like you. Soon they will realize thier mistake. Sorry this happened. You will eventually end up in a better place I am sure. Try to enjoy your day. You got a 60.04% upvote from @upmewhale courtesy of @progressivechef! File a complaint at the HR department about inappropriate conduct, etc. And when the HR itself is corrupted and in hands with the culprit...this is where things get worst! Time to get upper management involved at that point. The best advice I can give is to have a discussion with Human Resources on this issue, and if possible, talk to the person at fault telling how you feel about their actions and your discomfort. It is very important you do not allow this issue slide else it will become recurrent. This is exactly what I did my friend, but in the end I was served a termination letter. The use of power is such a dirty thing at any workplace. This post has received a 80.58 % upvote from @boomerang. Hi Bro, @progressivechef.... From your blog though it is not very clear, I could understand that something unwanted has happened there!!. Namaste sister! Yes something unethical happened to me, but I just moved on and now things are getting better for me! I'll get back to my bistro and blogging on steemit and live my life like that, much better. Hmmm yes sister, 2nd baby coming up soon...Rheem was quite ill couple of days back and was even being admitted, she got convulsion, it was the most scary moment of my life. we need to take notes. You got a 40.40% upvote from @postpromoter courtesy of @progressivechef! Oh no I'm sorry to hear of your situation. The worst I had was a more senior member made an unjustified complaint about me and I was forced to resign. I was pretty pissed because it was pure nonsense and it was basically they were jealous and felt threatened by my knowledge. I suspect same might be happening too you for similar reasons. I wish there was a way for you to maybe go at it alone start your own business you are the boss and you don't have to work for know one. Your company your dynamics. I hope u find a solution! Hello my friend! So happy to read from you! This is what I'll do now on, better I work for myself, be my own boss + blogging on steemit, life will be much better. Han sido tantas personas que han pasado por situaciones como esas, y nunca salen a la luz. Te doy mi apoyo, no podemos seguir aguantando maltrato de otros. Estas situaciones tienen que parar!. Friend it is a pleasure to know about you again, I really miss you a lot here, I regret that it is in these circumstances but I am here to give you your support. Regrettably in the whole world there are this type of problems intimidation, humiliation and harassment at work, it is mostly always spoken and defended is women, but men are also victims and you are an example of it. It seems unbelievable how people abuse their power to commit these acts against their employees, and it is unfortunate how many let themselves be humiliated because they put their family and their needs first, and they endure whatever it is, I am so happy that you did not leave and that you go To take this before the law, you are a great cheff and I am sure you will get ahead, steemit is a great help and support. Hey my friend! Hope all is well! Oh yes complete abuse of power here, I will go to any extent to have these people punished for such actions. Hi, the only advice that I can give you, is that you must defend yourself. Do not let them to see you falling. You must do something or you will have two consequences in the future: The company will continue oppressing you and, because of emotional reactions from your body, you will somatize your problem until it becomes a disease. Do not let them make you fall... you must fight until the end. At keast if one is getting higher packages then humiliation should be borne.Otherwise search for other job where no one insults in front of senior .Are one ready to quit job bcoz of humiliation @progressivechef ? They've fired me in the end, despite that I was right! What a world! 2 Suele suceder también que una persona se pone de victima ante una situación de la cual el responsable, que tan mala o bueno es ese algo para dicha persona ? Lo mejor que se puede hacer es defenderse con base sin caer al nivel de la persona que este agrediendo. Si tienes seguridad de lo que eres y lo que quieres. No tendras problemas de aclarar el mal entendido. puede el mundo de Steemit ayudar / aconsejar a alguien que sufre de humillación en el trabajo? Seguramente si. Mientras existan personas que pasan circunstancias similares " muchas las superan y tienen la madurez suficiente para crecer en todos los ámbitos y mas ese de paz en su vida. ¿Alguien puede tirar hojas de papel en la cara de alguien en una sala de reuniones completa? No debe estar vacía la sala para que el acto deje de ser notado " lo que esta mal es que suceda y por mas o menos que sea la humillación deje de ser subestimada . El problema principal es el silencio de todos y en vez de solidarizarse con el afectado se unen con el agresor dándoles aun mas poder. Lo mejor seria analizar y saber si estas en el lugar indicado. Give me one favor sir. please flag 🚩 all of my contents I want them to be less visible on search. Because I couldn't delete it now. You got a 43.48% upvote from @upme thanks to @progressivechef! Send at least 3 SBD or 3 STEEM to get upvote for next round. Delegate STEEM POWER and start earning 100% from your share, daily payouts ( no commission ). I called an attorney when my boss threw the pointy metal object that you stab restaurant receipts with at me. The attorney practically mocked me! It seems people can get away with anything. I finally ended up quitting my job not till after my boss broke my eyeglasses, hid my new pair of glasses outside, threw my phone in the garbage amongst countless other things. Of course she also fisxhed money out of my tips. I truly think you may be fighting a lost cause. Especially if witnesses don"t want to get involved and mess with their position at work. I know the frustration, anger and anxiety it causes. I wish you the very best, though. With me i stsrted feeling ethically dirty to be treated like that and stay and try to stick it out in hopes that things would get better but that kind of treatment youre talking sbout affexts your mental and physical health. I hate to sound so crass, but my advise is get out before things het turned around on you. Respect to you. Work place bullying is a common phenomenon. I have experienced it and most people I know have experienced it at some point or another. A lot depends on who is bullying you. Is this person a co-worker or a boss? Do you work with them daily or just once in a while? Most workplace have been worked in have some sort of workplace code of conduct. Often this is not enforced or inconsistently enforced. You should also have a representative that you can consult. So you should have options, it all depends on your workplace. You shouldn't have to work in an environment where you are uncomfortable nor should you be forced to leave either. Truth be told it is difficult to offer any advice until you explain your exact circumstances. I am not sure if this has been of any help but I hope you can resolve your situation. Respected @progressivechef #humiliation at work place is almost common. Why we continue to work with there? According to me is fear of losing . Best thing is if you think are right then just go and opposed, or you can wait for right time to hit the ball. Best of luck. @progressivechef, sorry to see you have less Steem Power. hello @progressivechef, In the middle of the 21st century, I believe that we end exploitation, abuse and humiliation, each country has its own laws and organizations that protect the worker. Actually, it does not explain what kind of abuse he suffered, but this type of abuse, verbal or physical, whatever it is, is punishable in almost every country. personally, I do not agree, I also mistreated you, the owner of the company, if you did not really value the work and the effort you put in for that job, then it's better that you retire and be in a place where they value it as a professional and person. The abuse came from a manager, who, although superior to you, is equal to you. is an employee, so personally I would write a letter to the owners of the company, showing my dissatisfaction with the way that person addresses the employees, so if I throw the papers in your face, that is physical abuse. I want you to solve that, in the welfare of your future. Just taking easy, everything for one reason, if you are the best in your job you should work just for you and not for someone else, it sounds like a metaphor like this phrase ....ºdon´t let the schooling interfere with your education..º so keep going and be successful..
hi @progressivechef . Upon seeing your post like this, I saw myself on your shoes. Just like you, I've been verbally harassed at work some 2 years ago before I eventually decided to resign. I am a nurse by profession. So sometime ago, I had received unrighteous treatments from my chief nurse and even doctors. They had even invaded my personal life and I was deprived of rest days because they hated me. I admit I had committed a few setbacks at work but that shoudn't be the reason to humiliate me just as if I was unprofessional. I had respected my colleagues so much until they pushed my buttons beyond my temper. They insulted me just because things didn't go their way. Sounded like they displaced their anger towards me instead to what got their nerves. Of course, as soon as "that happened" I expressed my true self to them face to face because I couldn't take anymore. I confronted them and told my reasons why I should not deserve something like that. Then I left. For me, you should do the same because you have a right to have respect. No matter how long would you endure the extremes at work, you won't grow professionally. And you those people who are getting on your nerves will cause emotional stress on your life. That's all i can say. I hope you'll find peace on your career. Great post! Welcome back and hang in there! Don't allow these "bullies" to get the best of you. Upvoted and Resteemed. Please everyone, Give me one favor sir. please flag 🚩 all of my contents I want them to be less visible on search. Because I couldn't delete it now.